It wasn’t that long ago that I was my oldest son’s age. I used to live with my mom and my grandparents in Florida. I had a sweet tooth even back then. I do feel like it is hereditary. I used to come home from school and do my homework while my grandmother cooked. I remember this recipe well since it soon became my favorite. 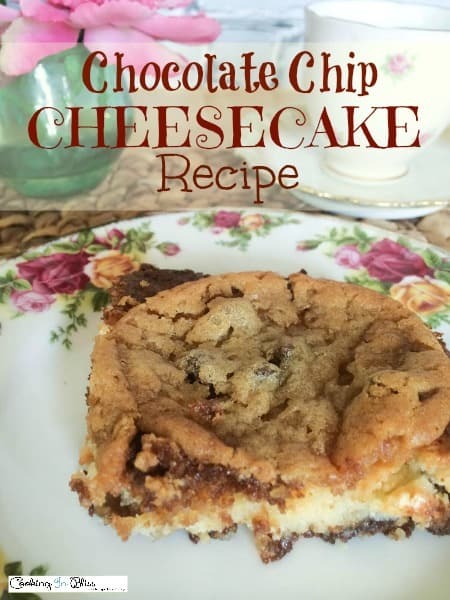 I would ask for this Chocolate Chip Cheesecake Recipe any holiday that could have a dessert option and I never was without it on my birthday. I had the opportunity to make it the other day just for fun. I thought it would be a nice was to talk about my grandparents with my children. You see every recipe has a story and I enjoy sharing mine with a bite of this or that. Cook for 50 minutes at 325 degrees. This is how this works you take a grease baking dish. I like the glass ones. 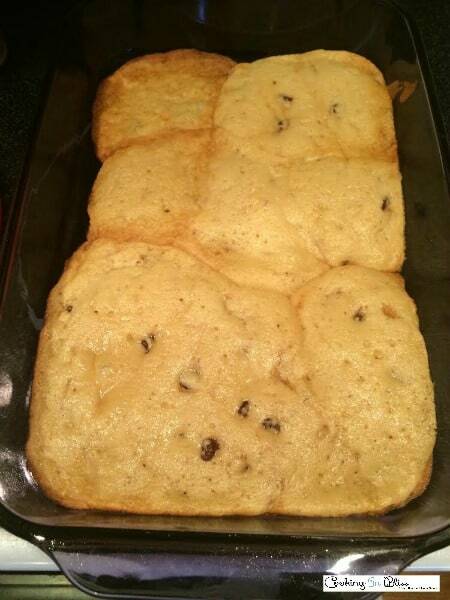 You split the cookie dough in half. The first half will be the crust and the second half will be the top. You place the dough in the bottom of the glass dish. It will spread so give it a little room to do so. I cook the bottom for about 6-8 minutes it should look a little cooked but not all the way. 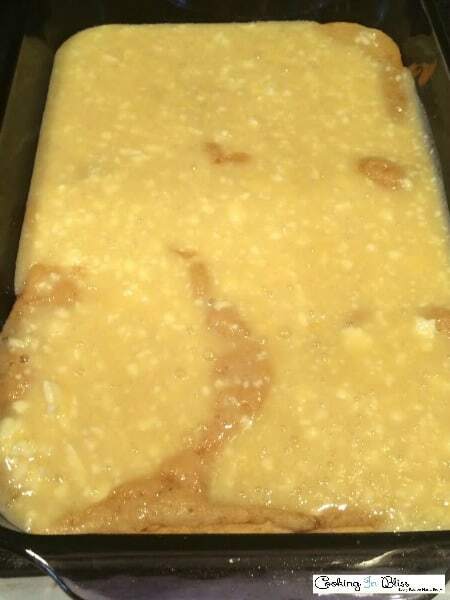 Then you will remove it from the oven and pour in the cheesecake mixture. You will cook that for 40 minutes. When it is golden brown. 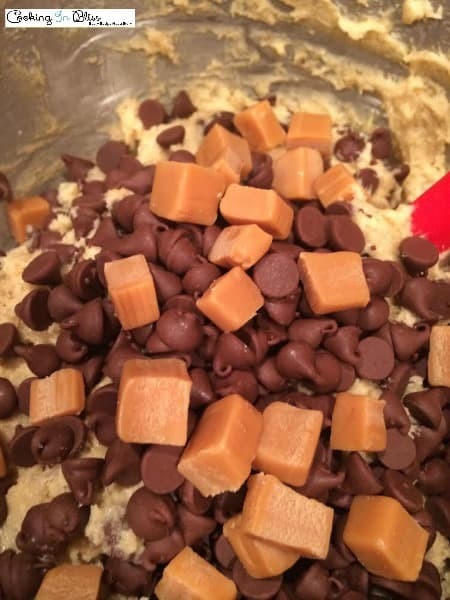 You will remove it from the oven and make cookie balls with the dough to cover the cheesecake. Then you will cook the cheesecake until the cookies on the top are done. Cheesecake is one of those foods that is so simple to make yet puts a smile on your face with every bite. 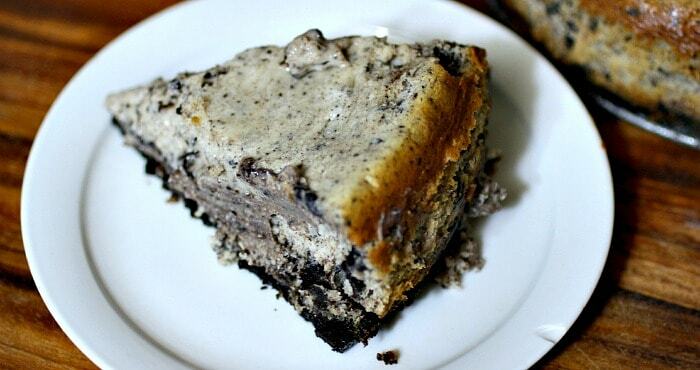 This Oreo Cheesecake is no different. I got the inspiration for this recipe while grocery shopping. I look at everything in the grocery store as a recipe and as soon as I saw Oreo’s sitting on the shelf the first thing that popped in my head was cheesecake. Naturally! Whipping up the Oreo Cheesecake was so easy and yes I did snack on a few cookies during the process – don’t judge me! I did have to keep reassuring myself the destruction of the Oreo’s was for a good cause – my belly! By the way, smashing Oreo cookies into itty bitty crumbs is surprisingly therapeutic. Sure you can use a food processor but I prefer my handy dandy meat tenderizer. Since this was my first time making an Oreo Cheesecake I decided to play it safe and Google it. I found a recipe here and decided to play off of that. It was hard to wait an entire day to try the finished product, but let me tell ya – it was well worth it! You’ll never look at Oreo’s the same after tasting the Oreo Cheesecake. I know I’m crushing Oreo’s and freezing the crumbs from here on out! Combine the melted butter and Oreo Cookie crumbs in a large bowl. I use a spatula to mix mine. Press into the bottom of a 9″ Springform pan. While the crust is baking, prepare the cheesecake filling. Use the paddle attachment with your stand mixer to whip the cream cheese on medium speed. 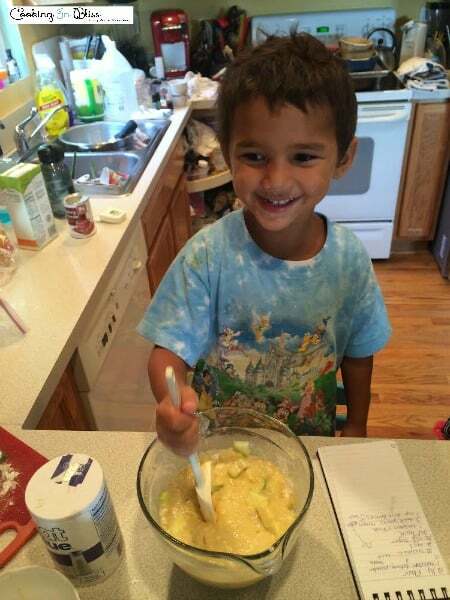 Add the sugar and mix to thoroughly combine. Add the eggs one at a time, continuing to mix, then add the yogurt and vanilla. Turn the speed up one notch and allow to mix for 2 more minutes. 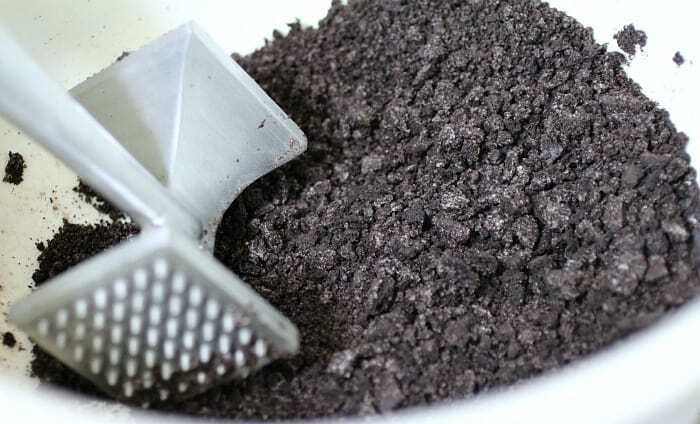 Carefully pour in the chopped Oreo’s and pour the batter in the baked crust. Make sure the filling is even and bake for 40 minutes. Allow the cake to cool at room temp for 2 hours then cover with plastic wrap and refrigerate overnight. Oh, Bananas, how I love thee. You’re such a delicious treat and you’re always there when I need you. You know it’s true; regardless of what time of year it is you’re bound to find bananas sitting pretty in the produce section. 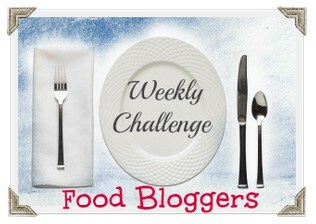 The ingredient for this week’s Food Blogger Challenge happens to be bananas so imagine all the yummies that are in store for us! I’m getting hungry just thinking about it. So what did I come up with for this challenge? 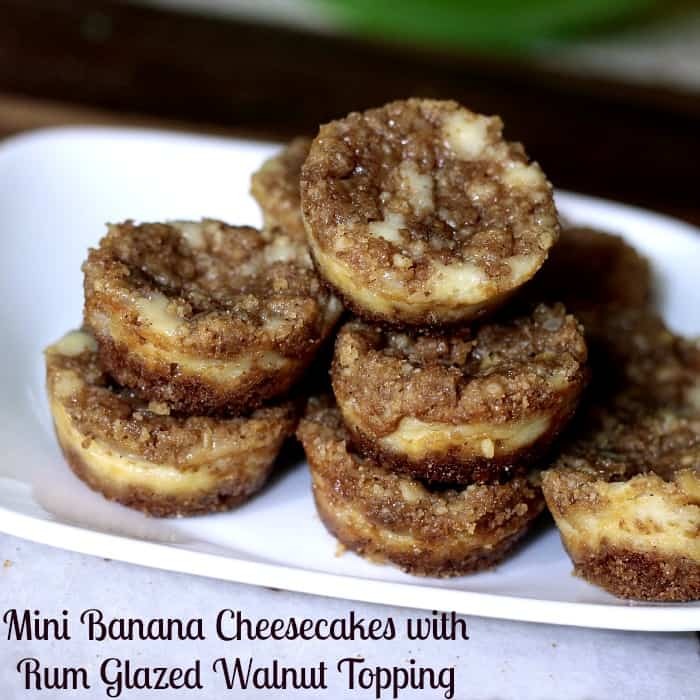 How about a Banana Cheesecake with Rum Glazed Walnut Topping? I love cheesecake but let’s face it – it can get boring. Yes it’s delicious like, all the time, but sometimes you just want to jazz it up a bit. Adding banana to the Cheesecake jazzes it up and gives you your daily dose of potassium in a scrumptious slice of bliss. 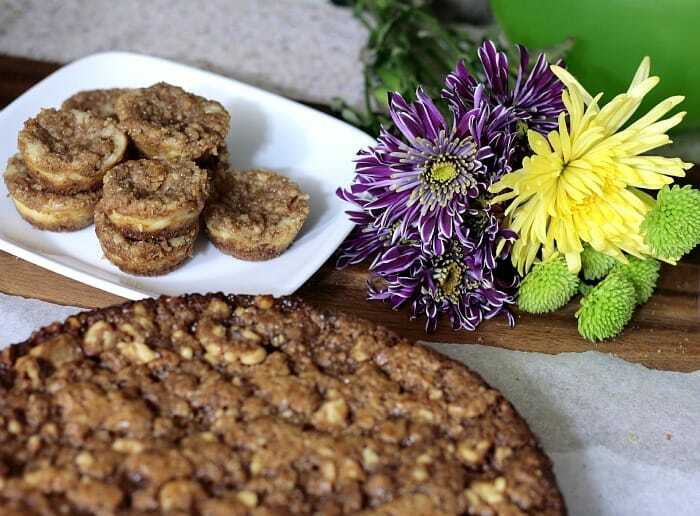 As if banana cheesecake weren’t enough, the rum glazed walnut topping is just icing on the cake, figuratively speaking – kind of. The banana flavor is very much alive in this cheesecake. The topping adds a much needed texture difference to an otherwise uniform dessert. 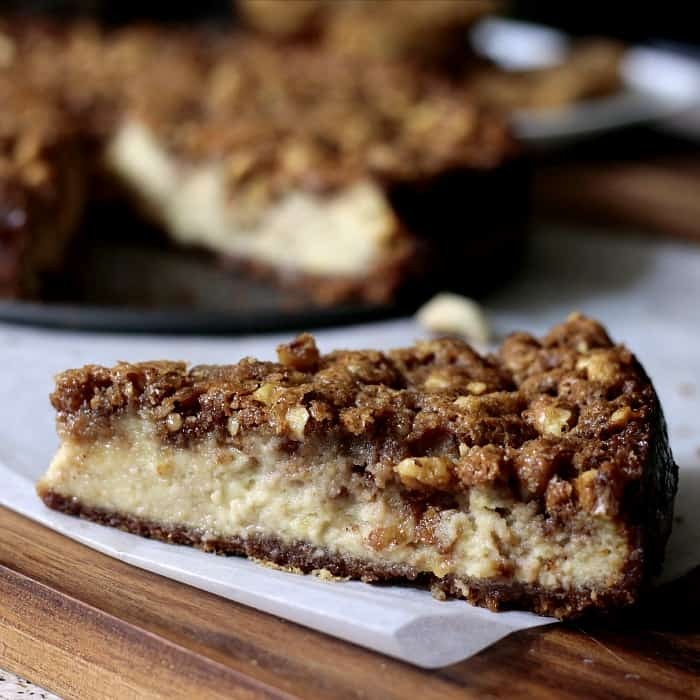 This is one cheesecake you have to try if you’re a banana fan. Preheat oven to 350 degrees. Butter or spray a mini muffin pan and a 9 inch pie dish. Mix the graham cracker crumbs with the butter, sugar and cinnamon. Press the remaining mixture into the bottom of the pie plate. Bake the crusts for 7 minutes. 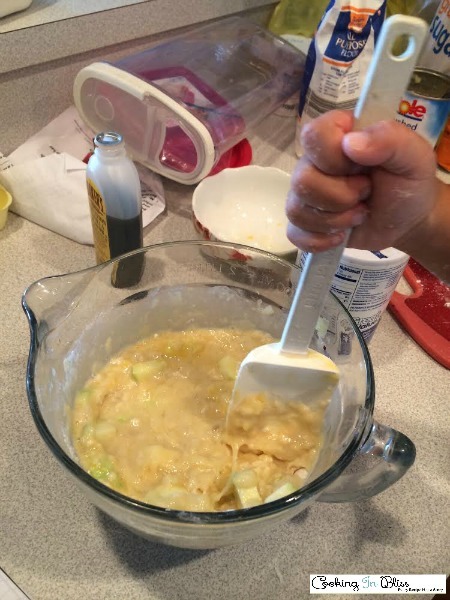 Mix together the cream cheese, sugar and lemon juice in a large bowl. Blend in the eggs, sour cream and bananas and beat for 2 minutes on medium speed. Pour the cream cheese mixture into the graham cracker crusts. Sprinkle the topping over the cheesecake, keeping it as even as possible. Cool the mini cheesecakes on a wire rack for 20 minutes or until at least room temperature. 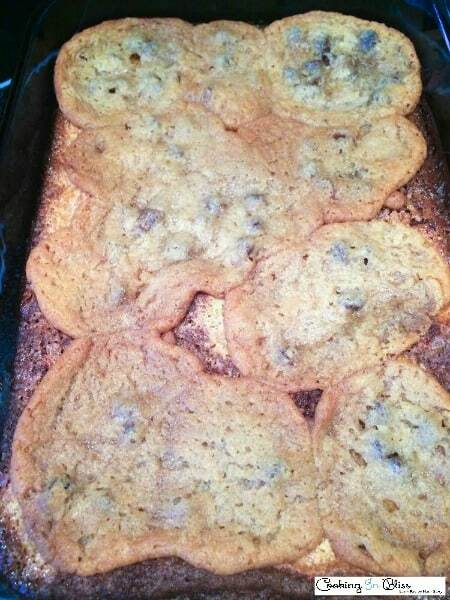 Turn the pan over onto a cookie sheet and allow to sit for another 10 minute. Flip the cheesecakes back over and chill in the refrigerator for at least 1 hour. Cool the 9″ cheesecake on a wire rack for an hour or until it’s at least room temperature. Chill in the refrigerator or at least an hour before serving. Combine remaining ingredients in a food processor and pulse 3 – 5 times until walnuts are chopped. Top the cheesecake with the topping before baking.